The Hula Supply Center, which was located on the corner of S. King and Isenberg streets, has moved one door over to 2338 S. King St. Owners Syl and Mike Kop, far right, are consolidating space and focusing on their Web business. The couple is pictured with, from left, Bev Pestano, Uncle Helemano Lee and Corlliss Smith-Tang (holding Kalana). Syl is holding Sara. The Hula Supply Center has a new home as it celebrates its 62nd anniversary today. Owners Mike and Syl Kop consolidated the shop and moved out of the corner space at S. King and Isenberg streets in Moiliili in mid-March. But they didn't move far -- they're just next door. The Hula Supply Center is now in the pink building -- a mini replica of the Royal Hawaiian Hotel -- at 2338 S. King St., which once hosted workshops and community events. The space is smaller, but closer to the parking lot. To enter the small shop is to enter 62 years of rich and colorful history, with every hula supply, craft and implement imaginable, not to mention a warm greeting by the shop's owners and their two friendly toy poodles -- Kalana and Sara. The business, started by the late golf fanatic and entrepreneur B.K. Kop, has grown into a global business. The first Hula Supply store was on Fort Street in downtown Honolulu. The store has been at King and Isenberg since 1954. While there has been a consolidation, the Kops are at the same time growing in other directions. The Hula Supply Center is one of the five retailers that joined forces last year to open Mana Hawaii -- the Spirit of Hawaii Nei, a unique shop offering authentic made-In-Hawaii goods at Waikiki's new Beach Walk. They are also looking to expand to neighbor islands. With the changes, the Kops are putting a new emphasis on promoting Hawaiian artists and artisans. The store, for instance, features kahili made by Uncle Helemano Su and beautiful hairpieces by Corliss Smith-Tang. "Our whole emphasis is about promoting Hawaii and the people of Hawaii," said Kop. The move to the pink building means a new layout. In the back, what used to be a storage room will offer specialty items from throughout Polynesia, including a large selection of fabrics. Syl Kop has special editions of pareos that she designed, along with pareos designed by eight to nine other artists. She also has a line of Aloha shirts, with hand-printed motifs based on her research at the Bishop Museum. As they head to Merrie Monarch Festival this week, the Kops are once again bringing hula implements and new specialty items. Going every year is a tradition, but more about love for hula than about business. "We go to have fun, and to honor all of Hawaii's premiere hula practitioners," said Syl Kop. "Sales are not the important thing. We are there to be a participant." Online sales from www.hulasupplycenter.com and phone-in orders continue to pour in from all corners of the world, with international sales making up about 40 percent of revenue and the U.S. mainland making up about 20 percent. The other 40 percent is local. The Kops have several projects in the works, and plan to travel more in upcoming years. 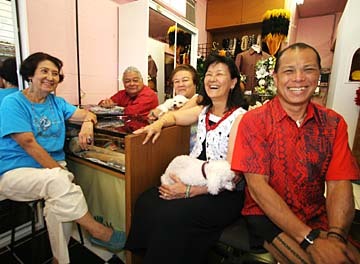 With all the flurry of activity, though, they still felt it important to keep a small retail presence in Moiliili, to welcome between 40 to 70 customers who walk in per day. One 80-year-old customer, now living on the mainland, said walking into the shop felt like coming home. There are up to 250 schools in Hawaii that are clients along with 250 halau -- hula schools. Hula halau from as far as Paris order items from the center. Clients also include Disneyland, which orders Tahitian skirts for Goofy and Mickey Mouse to wear during parades. The store is a source for all things related to hula -- from flower lei (in tuberose , pikake, puakenikeni and ilima) to kukui nut lei, flower hair adornments, pa'u skirts. There are also Tahitian costumes. In all, there are at least 500 different accessories. Along one wall, there are lauhala bags along with hand-quilted bags. There are also gift sets, ukuleles, T-shirts, books and music CDs related to hula. Mana Hawaii in Waikiki is attracting a different kind of buyer than the shop on King Street -- a higher-end buyer who is willing to buy a handcrafted ipu, without worrying as much about the quality of its sound, so much as to hang something authentic on the wall back home. For years, Mike Kop has handcrafted every hula implement under the sun, ranging from several types of uli uli (which require 25 steps) to bamboo pu'ili, ipu and ipu heke. He also makes hand-dyed Tahitian skirts, does custom-ordered items and has a great passion for all the crafts as well as hula. Kop, a student of kumu hula Robert Cazimero and the late Uncle George Holokai, learned most of what he knows from his father, B.K. Kop. As early as four years old, he rode along in the family station wagon, picking up handcrafted items from vendors. Today, he perpetuates the culture by offering classes and getting involved in numerous keiki hula competitions.